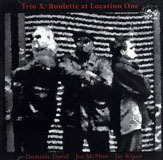 This is the third release by Joe McPhee, Dominic Duval and Jay Rosen, three virtuosi known collectively as Trio X. It was recorded live in March this year and must set a record for hitting the streets so quickly – all kudos to Cadence Jazz Records. Like previous releases by the group it is an intriguing blend of the lyrical, whether composed or extemporised, and the abstract. Where it differs is in the relationship with the American songbook – this time out we hear ‘My Funny Valentine’, and ‘Send In The Clowns’, as well as ‘Blue Monk’ and more unusually ‘Try A Little Tenderness’, along with McPhee’s classic piece for Ornette Coleman ‘Old Eyes’. McPhee is no stranger to these songs – ‘Valentine’ also appears on the trio’s earlier ‘Watermelon Suite’ on CIMP, while McPhee and Mike Bisio explored the Monk tune on ’Finger Wigglers’, also on CIMP. Some of the tunes arise as part of the trajectory of the group improvisation, almost as if they have been uncovered during performance and then examined to see what they bring to the table. ‘Monkin’ Around’ begins very quietly with breath sounds through McPhee’s trumpet, before group interplay climaxes with a riffing trumpet. McPhee then switches to tenor but maintains the same riff, before uncovering ‘Blue Monk’ with the rhythm section falling in behind. ‘Try A Little Tenderness’ begins with understated bass electronically manipulated, before developing into a three way conversation with tenor and percussion. McPhee delicately states the theme and sticks fairly closely to it during the ensuing group improvisation. The piece builds, with Rosen suggesting some march rhythms before winding down to the dénouement with arco bass and the final affectionate theme statement. 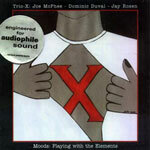 Similarly on ‘My Funny Valentine’, McPhee tenderly caresses the tune, at first on tenor, then on trumpet. The piece starts with an energetic percussion solo, with shouts and rhythms beaten out on the body, before kicking in with a fast rhythmic backdrop over which McPhee sets out the theme. ‘Trail of Tears’, dedicated to Jim Pepper (a musician who fused his Native American heritage with jazz), opens with a sparse tenor and bass duet, with McPhee teasing out harmonics and whistles from his horn, before building into a storm force trio improvisation. Snare drum waves batter a whirling bass and electronics hurricane overlain with tenor cries and foghorn honks. The fury ends suddenly and leads into a quiet passage where the tune of ‘Send in the Clowns’ makes an incongruous appearance. Duval sets up a melodic riff from the kernel of the melody and McPhee mutates this into an ominous tenor riff which heralds another group improv with a sublime passage of harrowing tenor multiphonics. The anthemic piece closes with a stately revisiting of the theme over arco bass. ‘Old Eyes’ begins with a loud drum solo which turns into a funky drum and bass boogaloo. McPhee’s tenor lays out the beautiful theme over the rhythmic quilt, before beginning an impassioned extemporisation which builds to high register squeals and a breathy conclusion, not a million miles from where this fine recording started. 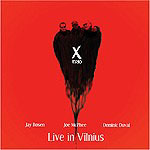 Bob Rusch, in his liners to the groups first disc, characterised Trio X as the mellow avant-garde, mellow and soulful. That neatly sums up this excellent 73 minute taste of Trio X live on tour.